Hello lovelies and happy Sunday! Sorry for slacking off again from last week's post. I wasn't really in the mood for posting last week end. 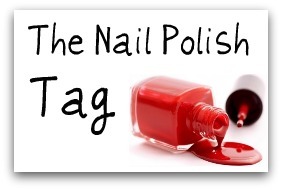 Today I have another nail tag. It's been almost 2 months since I did this nail tag and now I have been tagged by Rachel-Karina from Polished Criminails to do another one. Some questions are similar to the first one, but that way you can see what has changed (polish count especially). So let's begin! I have hit the 75 mark now. That means I've acquired 20 from my last tag. Not that bad for two months. Of course it's China Glaze. I'm a true fan girl! I used to like it more, but now I'm kinda over it. But hate is pretty harsh. I would still wear it from time to time. My first polish was a Maybelline. But the first brand I had more of is S-he Stylezone. Not sure if Lacquer Buzz would be a proper name. Would have to think really hard about this. It took me some time to come up with the name for my blog too. I don't like how gold and copper shades look on me. Luckily, I don't really like those colors either. Blue is my top color. I would say darker colors look best on my skin tone. I don't have any. The people I'm friends with aren't into nail art. It was, hands down, Revlon Facets of Fuchsia. It was actually a giveaway win, but I love it to pieces and can't imagine not having it in my collection. Thank you Rachel! It is actually the first time someone tags me specifically. I'm flattered that I was one of your top five choices! Yeah, I've cheated a bit. I've tagged only 4 bloggers. I didn't want to tag anyone that doesn't want to be tagged. If you wanna do this tag, don't mind the rules, just do it! Also, stay tuned because I have another post in store for you today! Have a great Sunday!